Stores reference 6D/644. Size small. The rubber is really quite clean, reasonably supple and the overall shape is very good. The mask is 98% crack free but there is very minor cracking/crazing on the nosewire lugs and a small split near the nose. These look far more significant in the photos than they really are! This example has a distinctive roughened texture to the upper part of the moulding, a feature of early mouldings introduced to help reduce problems with icing at altitude. The harness is faded and has lost most of the original elasticity but does retain one original elastic band. Fitted with the early figure '8' harness clip. Lined in beautifully clean brown suede. 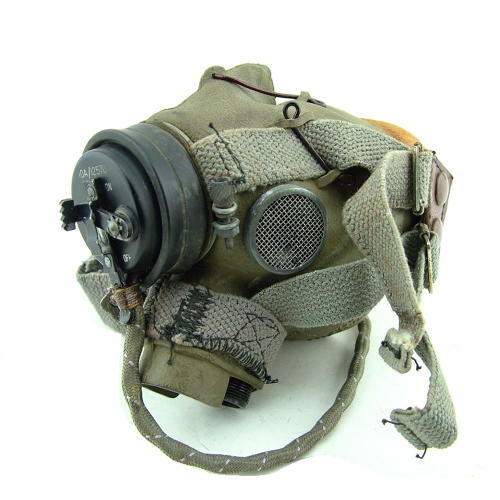 The mask is fitted with a type 48 microphone assembly (type 25 microphone, loom and socket) complete with internal anti-freeze gauze plate. An very good '+' to excellent unused example. Stock code O22060.